The Heinkel He 60 was a German single-engined biplane reconnaissance seaplane designed to be catapulted from Kriegsmarine (German Navy) warships of the 1930s. The Heinkel He 60 was designed by Heinkel engineer Reinhold Mewes, the designer of the He 59. The resulting design was a single-engined biplane of mixed wood and metal construction with fabric covering. Its single bay wings were of equal-span and had significant stagger. The first prototype flew early in 1933 and proved to be underpowered with its 492 kW (660 hp) BMW VI engine. The second prototype had a more powerful version of the BMW engine, but this only marginally improved its performance and was unreliable, so production aircraft reverted to the original engine. 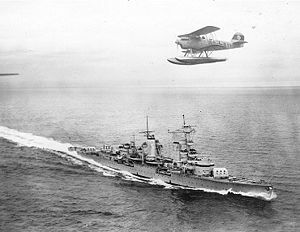 Of conventional configuration, the He 60 was a sturdy aircraft, designed (as the specification required) to be capable of operating on the open sea. As a result, it was always somewhat underpowered for its weight, which made handling sluggish and the aircraft vulnerable to enemy fire. Attempts were made to solve its lack of power by fitting one aircraft with a Daimler-Benz DB 600 engine, but engines were not available for production. In 1939 it was replaced as a shipboard aircraft first by the He 114 in service, then soon after by the Arado Ar 196, but it remained in service with several coast reconnaissance Staffeln (squadrons) when World War II began. It had been withdrawn from front-line service by 1940, but returned to use following Germany's invasion of the Soviet Union in 1941, being used for coastal patrol work in the Baltic and Mediterranean Seas. All He 60s were removed from service by October 1943. First prototype which began flight testing in early 1933. Second prototype which experimented with a more powerful engine. However, it proved no better and the design reverted to that used in the 60a. Third prototype, used for successful catapult trials in early 1933. This aircraft was delivered into operational service with the navy. 14 pre-production aircraft were ordered. A total of 81 A-variant aircraft were produced. Initial production version, commencing in 1934. In 1933 a single aircraft was fitted with a 671 kW (900 hp) Daimler-Benz DB 600 engine in an effort to improve performance. However, the development was dropped. In late summer 1934, the improved C-variant went into production, with first deliveries in Autumn 1934. The D-variant was similar to the He 60C, with the capability added for a fixed MG-17 machine gun and improved radio equipment. Production commenced in June 1936. 6 aircraft were ordered by Spain, and these D-variants were called the 60E, ending delivery in April 1937. They flew coastal patrols in the Spanish Civil War, and the last aircraft were withdrawn from service in 1948. Donald, David (editor). Warplanes of the Luftwaffe. London:Aerospace Publishing, 1994. ISBN 1 874023 56 5. Smith, J.R. and Kay, Antony L. German Aircraft of the Second World War. London:Putnam, 1972. ISBN 0851779204. Heinkel He 60 Pictures and Heinkel He 60 for Sale.